(Photo: © Peter Kenny / Ecumenical News)World Council of Churches general secretary, Rev. Olav Fykse Tveit after signing an agreement to work with UNICEF speaks to Liza Barrie, chief of UNICEF's Civil Society Partnerships Unit. The World Council of Churches and UNICEF have signed a partnership to work together to support children's rights, with special initial focus on two major issues: violence against children and climate change. UNICEF will work with WCC members – over half a billion Christians in 140 countries – to recognize, monitor and promote children's rights within their communities and congregations, the WCC said in a statement. "The World Council of Churches is well placed to answer the international community's call to help bring about a world fit for children," said Rev. 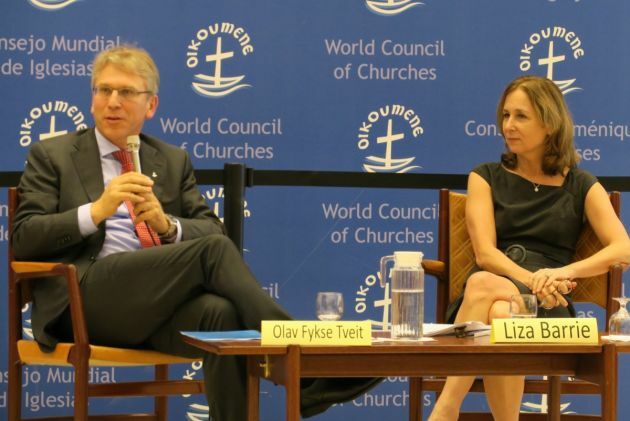 Olav Fykse Tveit, the WCC general secretary. "From a faith-based perspective, we will call upon member churches to improve the lives of children through the development and implementation of child rights principles and tools," he said. UNICEF's knowledge on children's rights and violence prevention and the WCC's longstanding theological legacy and commitment to children, will help the UN group and the churches achieve positive change for children around the world. "UNICEF has a long history of working with religious institutions," said Liza Barrie, Chief of UNICEF's Civil Society Partnerships Unit at the Ecumenical Centre in Geneva. Both WCC and UNICEF have a strong track record in confronting violence against children. The World Council of Churches had a "Decade to Overcome Violence 2001-2010." UNICEF's most recent report on the subject, Hidden in Plain Sight, sheds a light on the magnitude and pervasiveness of the problem, calling for action at all levels of society. Climate change will undermine the basic rights of children, and those from the poorest families will suffer the most. The partnership will aim to influence behaviours to reduce carbon footprints, by working together to raise awareness and end harmful practices. It will make use of UNICEF's strong evidence on the adverse impact of climate change on children with WCC's broad reach to families and communities. "The commitment of WCC's leadership to support young people as agents of change reflects the organization's goals to promote implement and monitor children's rights around the world," said Barrie. The partnership will develop "Children's Rights Principles and Tools for Churches", outlining actions members may take to support children's rights. It will help WCC member churches, specialized ministries and ecumenical partners apply the "principles" within their own domains, and also to be advocates for children's rights within the wider community, both in terms of individual behaviour and public policies. 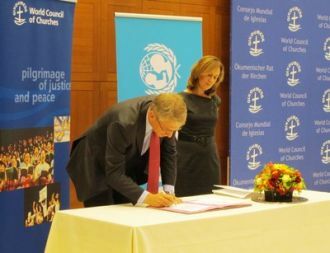 (Photo: WCC)World Council of Churches general secretary Olav Fykse Tveit (L) signing a partnership between the WCC and UNICEF with Liza Barrie, chief of UNICEF's Civil Society Partnerships Unit. In addition, WCC members can undergo ethics training conducted by Arigatou International. The global faith-based organization will use the model it developed with UNICEF and UNESCO, "Learning to Live Together," to offer training sessions on children's rights among congregations, the WCC said. WCC and UNICEF will hold a seminar in Geneva on November 19 ahead of the anniversary of the Convention on the Rights of the Child (November 20).